A super soft, full coverage wire-free bra with racerback convertibility. Features include adjustable straps, and full coverage cups with a light lining. A beautiful half cup bra by Simone Perele with embroidered details and athletic inspired elastic. Straps can be converted to racerback. 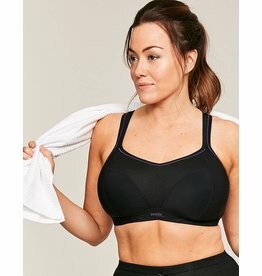 Amazing support and control from this non-wired sports bra by Panache. Full coverage, extreme control, and maximum comfort. Straps can be worn normal or j-hooked for racerback tops.